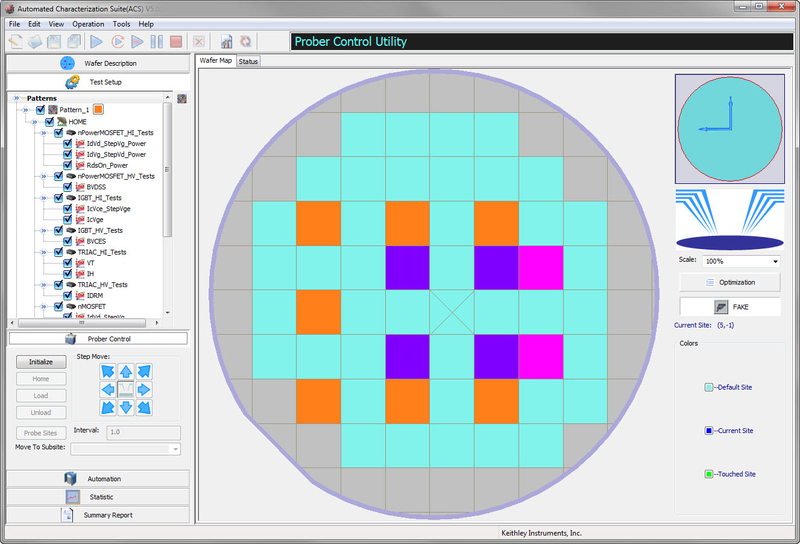 Keithley Instruments, Inc., a world leader in advanced electrical test instruments and systems, has announced enhancements to its Automated Characterization Suite (ACS) software that support its expanding family of high power semiconductor characterization solutions. The ACS package is optimized for automated wafer-level parameter test applications, including automated characterization, reliability analysis, and known good die testing. The ACS V5.0 update specifically leverages the high power capabilities of Keithley’s Model 2651A (high current) and Model 2657A (high voltage) System SourceMeter® SMU instruments to enable automated wafer-level testing of high power semiconductor devices like power MOSFETs, IGBTs, BJTs, diodes, etc. To learn more, visit www.keithley.com/products/semiconductor/characterizationsoftware. · High power device libraries designed for use with the Models 2651A (up to 50A or 100A when connecting two units) and 2657A (up to 3,000V) System SourceMeter SMU instruments that support testing multi-terminal power components in conjunction with lower power Series 2600B SourceMeter SMU instruments or the Model 4200-SCS Parameter Analyzer to speed and simplify creating modules and sequences for testing power semiconductor devices like power MOSFETs, IGBTs, BJTs, diodes, etc. · Support for hardware scan, recognition, and configuration management of the high power Models 2651A and 2657A so users can quickly connect these instruments to a PC, confirm connectivity, and begin testing. · Support for Series 2600 SMU instruments equipped with the TSP-Link® inter-unit communication bus, leveraging the on-board test script processor (TSP®) technology for a multi-processor environment that provides high parallel throughput while speeding and simplifying test project development. · Sample projects for tests such as high voltage wafer level reliability (WLR) that build on the wide range of low power reliability test capabilities provided in earlier ACS releases, providing users with an excellent starting point for creating or modifying new tests quickly. · Support for the ±200V C-V capability of the Model 4200-CVU-PWR C-V Power Package option for the Model 4200-SCS Parameter Analyzer to provide a broad range of I-V and C-V measurement capability for full characterization of semiconductor power components. ACS combines multiple instruments into a unified test environment optimized for flexibility, speed, and productivity in testing and analysis. Its intuitive GUI simplifies configuring test instrumentation, setting measurement parameters, making I-V measurements, and displaying results. Users can go from creating a new test setup to characterizing new devices in a fraction of the time required by older test development approaches. Just as important, ACS provides all the tools needed to set up tests, analyze data, and export results - without ever leaving the ACS environment. 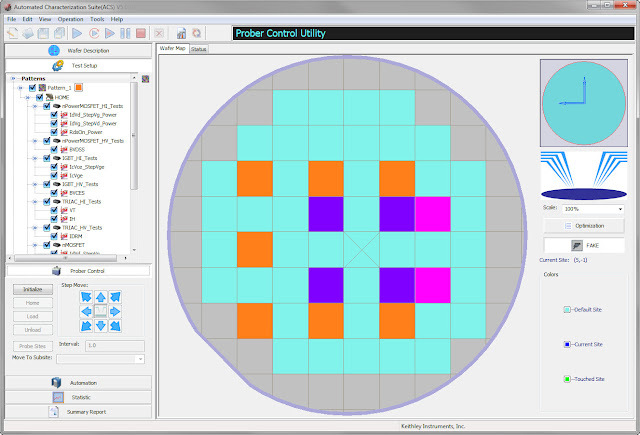 ACS is designed for testing with semi and fully automatic probers; Keithley also offers ACS Basic Edition software for performing semiconductor device characterization with manual probers or test fixtures. ACS V5.0 is available with a number of Keithley characterization instrument and system configurations. Users of earlier versions should contact their representative for assistance regarding ACS upgrades. Visit www.keithley.com/products/semiconductor/characterizationsoftware or contact the company.